2. Shred chicken and place in a bowl. 3. Place the ginger, garlic, rice vinegar, lime juice, sugar, kaffir lime leaves and chilli in a bowl, add the chicken and stir to coat. Set aside for one hour to marinate. 4. Place the flesh from one of the mangoes in a food processor and puree, then add the oil and process until smooth. Thinly slice flesh from the remaining mango and set aside. Drain the chicken, reserving the marinade, and return to the bowl with cucumber, snow pea shoots, mango slices, coriander and shallots. 5. 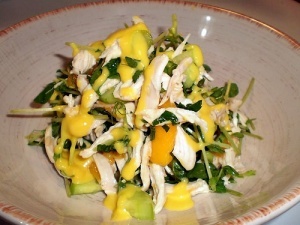 Stir mango puree into the reserved marinade and drizzle over the salad.